I am at the very begining of a DIY Solar electric system, I need to submit a one-line drawing to my power company to get approval for a rebate. I have chosen to use Trina TSM-PAO5 235w panels with Enphase Micro-inverters (M-190?) I want to be able to add to the array at anytime until it isnt cost-effective to add to it anymore and I dont have lots of cash to invest at 1 time. Question: I want to install 20 panels, I can connect 14 micro-inverters in parallel, do I use a sub-panel with circuit breakers to connect the other panels also in parallel? 14 inverters to one circuit breaker and add a second circuit breaker to add the other 6 inverters? Then connect them downline at the PV Meter Socket that then goes to the AC disconnect then to the Main service panel? Sorry for the long question but I cant get a straight answer from anyone and thats the frustrating part? Pretty much you have the basics... Things to watch out for. Sizing of your main panel... You are allowed to add 20% of rated panel worth of circuit breakers (per phase) maximum (solar power breakers must be installed at the opposite end of the bus bar from the main breaker). So, if you have a 200 amp panel with 200 amp main breaker, you can add 40 amps worth of circuit breakers (1 pair of 40, 2 pair of 20, etc.). If you have 200 amp panel with 125 amp of main breaker, you can add (200-125=75 amps; then 20%*200a=40 amp; 75amp+40amp=115 amps total). You may be able to add a solar sub-panel if you understand the above rules and how the sub-panel connects to the main panel (I am not a licensed electrician) -- But go over this with your electrician / building inspector to ensure they agree with any plan. One issue about adding panels one at a time--Technically, you need a new building permit (and possibly power company approval) each time. Obviously this is not cost effective process. To add more than ~15 micro inverters--You need to add another 15/20 amp breaker/branch circuit to the electrical panel to connect the next set of inverters (follow code and manufacturers instructions). I spent the better part of the afternoon combing the enphase web site videos and information and discovered they are called branch circuits, every bit of additional information that I gather I get "" that much closer to sounding like I know what I'm talking about. I talked with my electrician buddy and he wasnt familiar with micro-inverters but by tomorrow he probably will be... I built my own house (buddy did electrical) and he installed a 400amp panel, lots of room for expansion, but thank you for the heads up. I agree with you 100% about the power company and the build permits, but... my power copany is offering $1.70 per watt rebate and switching soon to $1.35 per watt rebate and realistically I will be saving....buying...saving...buying for the next year or so to get 20 panels up, then after I get a rebate I will probably put up another 8 to 10 hopefully and so on and so forth so I am in a catch 22. As long as I get the plans in before the rebate drops I am locked in until I get the panels up or the program expires. Combiner Box is a Loaded term here... There are combiner boxes used for (mostly) off grid solar arrays. When you have three or more parallel connected strings of solar panels, each single series string needs a fuse/breaker to protect the string from over current if there is a short. So, "Combiner Boxes" are those boxes with 3-6 or so breakers/fuses to combine solar array strings before they go to the Solar charge controller or central Grid Tie type inverter. A sub panel for your home (as I understand it--I am terrible with technical terms/definitions) would simply be--for example, a 100 amp branch circuit from your main panel then to the sub-panel... And then you would populate that sub panel with 15/20/etc. breakers to operate local devices--Or in your case, you would populate it with breakers to bring branch circuits to each Enphase string of inverters. Now--This gets tricky... Say you buy a 100 amp sub-panel for your Enphase inverters. Normally, the sub-panel would be allowed 20% of 100 amps, or one 20 amp 240 VAC branch circuit--Instead of the 5x20 amp branch circuits you may have been planning. Could you convince your local electrician buddy and your building department to allow you to populate that one sub-panel with 5x 20 amp Enphase branch circuits--As I understand the code--the default answer would probably be no. The code assumes that the box could be stuffed full of breakers at any time (load, Enphase, etc.) for any arbitrary branch circuits. So the box bus bar could be "overloaded" down the road (i.e., you could put an electric drier, an A/C system, etc. from that same sub-panel and exceed the NEC rating for loads+20% rating for solar). Perhaps you can placard the sub-panel as being for Solar Power Only, no other branch circuit connections are allowed? I would believe the proper solution would be to home run each Enphase branch circuit back to your main circuit panel (install wiring now and cap off unused circuits, install empty conduit+boxes now and pull wiring later, or run more branch wiring later assuming you have access through walls/attic space). (but this may be wrong, if as below, you have to have a revenue meter for the GT branch circuits for the power company). I am a little confused with this statement... 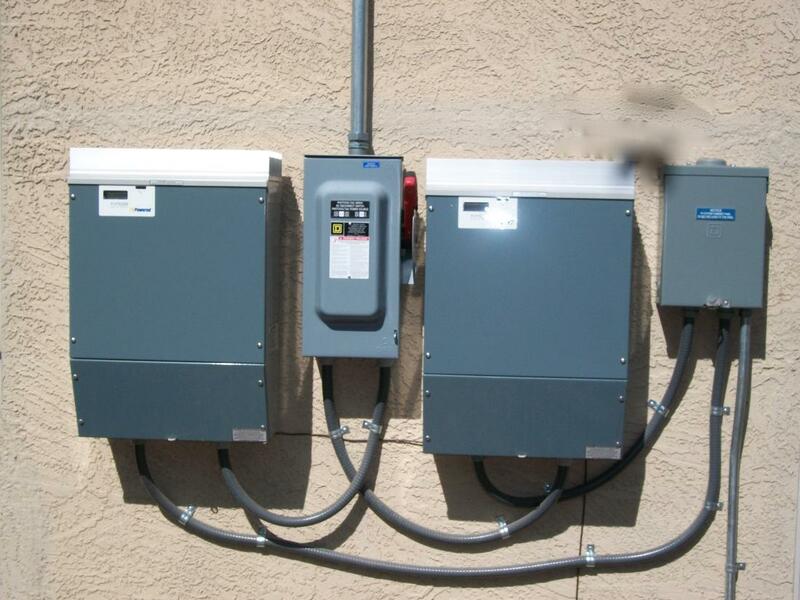 I am guessing that your utility requires a revenue meter on the Enphase / GT inverters? Or do you just want to add a meter to track your power generation? What is your main service panel? Connection to utility drop? Meter+main disconnect for home? Some utilities require two meters, one for the home and a second for the GT system as they pay different rates for power generated vs charges for power consumed. Is the Enphase meter to be connected to the utility drop (line side splice or you have to have a two socket utility connection) or is the Enphase meter supposed to connect to your main service behind the home's meter? Hopefully an electrician here can help you with the details if you need to connect a revenue meter or want to use a sub-panel for connecting the Enphase arrays. Your up late this evening. The Main service panel is where the utility company reads the meter and most your circuit breakers are installed (Meter+main disconnect for home). I really appreciate the information and suggestions you have given, Thank You Bill! I at least will now be able to get my drawing submitted and then see what they have to say from there? They always seem to want more or less of something? I have (if I recall correctly) have seen all three types of metered connections depending on utility/state puc requirements (net meter, two meters to mains, and revenue meter under main meter). The disconnect is also an issue... The original reason for a accessible disconnect on the side of the building was to allow the utility, if they choose for whatever reason (say to work on down power lines), they could go to your home, open the GT inverter disconnect and lock it out with a pad lock until the job was done. The "threat" was that if the utility could not access the GT lockout, they would simply pull your meter for the whole home until the work was done (or whatever issue they had with the GT inverter was resolved). The exterior AC GT lockout, as far as I know, is still a popular requirement for many/most(?) utilities. Many central inverters have the AC/DC lockout as part of their power box. Obviously, Enphase does not. In Northern California, PG&E accepted the fact that a Listed GT inverter cannot generate power to hurt the line crew--so they have done away with the requirement for a GT inverter disconnect. Make sure you understand, in detail, the requirements of your local building inspector and utility--Even if they tell you some "wrong" information about how they want the job done--they can always have you "correct it" before final sign off. In some jurisdictions an "aggregation panel" is allowed, which amounts to an AC combiner box. I believe that the stipulation is that it have no loads attached and that it be plainly marked. I'm not sure if it can have a main breaker or not, but if it did it would certainly not fit the 20% rule. In some places it is the only way to add multiple inverters to a service because they will only allow one backfed breaker in the main service panel. Thank you ggunn & BB for your responses. I talked with my supply house this moring and he more or less confirmed what ggunn is saying, in normal people speak an electrical junction box, the micro-inverters connect in paralell then the last one has 4 wires comming off of it, wire these similar as if you were wiring a 240 circuit run it to your pv meter socket then ac disconnect and finally circuit breakers/ main service panel. Like someone else said earlier, substitute junction box with sub-panel and you have the right terminology. Two 9-panel/inverter arrays each on their own 240V 20A circuit/string. Yep my dual 6000 watt inverters have an AC combiner with 2 breakers clearly marked to not add loads to back feed the single breaker in the main panel. it is off to the right in this old photo. PS seriously considering a replumb on all that flex. One thing. Enphase inverters (one per module in the array) connect to each other in parallel, but the wiring path sort of looks like they are in series; only the inverter closest to the service connects to it, the rest each plug into the next one down the line with a multipin connector. Yeah, a bit sloppy with all the overlapping conduit. Would look a lot better with some cleanly installed EMT!